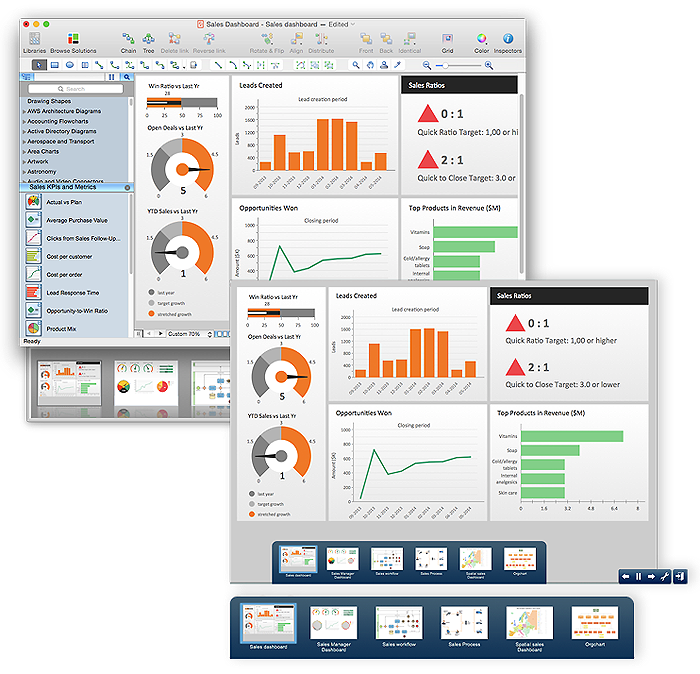 ConceptDraw PRO simplifies and enhances presentation generation with flexible slide construction, automated processes, and Live Object technology for displaying external data. You’ll find an extensive library of over 20,000ready-to-use objects, with hundreds of templates and examples to get you started quickly. We also support dynamic presentations that contain live content and can be edited on the fly to reflect input from collaboration or feedback. Presentations can be exported to numerous graphical formats or emailed as a slide show. ConceptDraw PRO presentations can be displayed in full-screen, automated playback mode, or using dual monitors — display on one, edit on the other — for team collaboration. 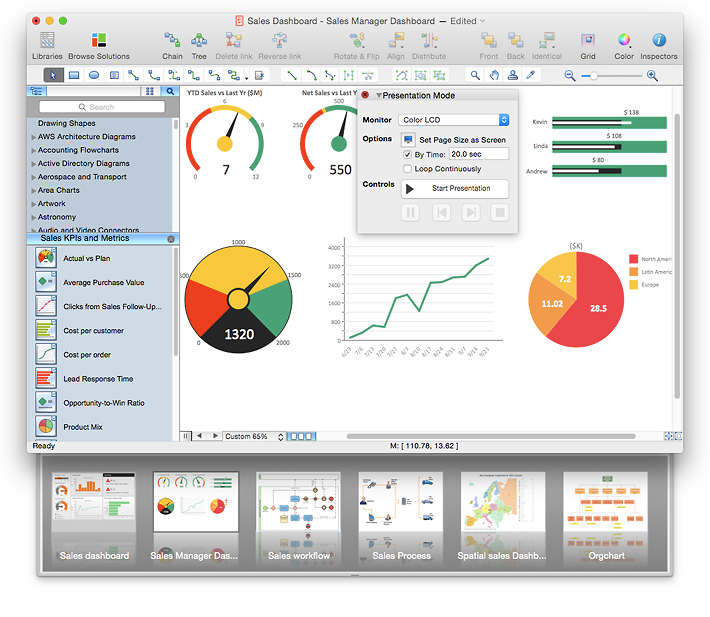 Dynamic presentation allows you to display your presentation on a secondary monitor or projector, while your main monitor is left open for you to make edits as you move through the presentation. This gives you the unique ability to collaborate with team members in a meeting setting or quickly respond to feedback from your audience. 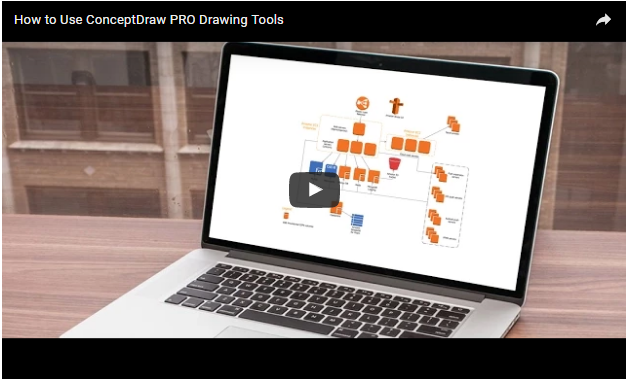 Any diagram or drawing you make in ConceptDraw PRO can be a dynamic presentation — everything from flowcharts and block diagrams to network diagrams and wiring schematics. Creating a presentation, slide by slide, in a multi-page format provides maximum flexibility when presenting and using presentation content. You can take additional control over your presentation by formatting the appearance of each slide with background pages, color schemes, and clip art. Hyperlink to other objects and pages within the presentation, or to external documents and web pages. The benefit of this feature is that your presentation is not confined to one source of content; all resources are available for your audience. You can create presentations that contain live objects. Live objects can be set to respond to external data sources, such as a file database or different data feeds on the internet. You can export your presentation to Microsoft PowerPoint for presenting locally, or to Adobe Flash (SWF) for presentation over the web. You can have complete control over the pace and direction of your presentation by manually progressing slides and navigating with hyperlinks, or set the slide order and let your presentation play automatically.